IF the spirit of Noel Coward hovers around any theatre where his plays are being staged, it must have been very blithe last week, when Dramatic Productions staged his delightful satire on the vogue for seances and spiritualism in the appropriately Art Deco setting of Wimborne’s Tivoli Theatre. Blithe Spirit is usually seen primarily as a star vehicle for a great character actress – as with Angela Lansbury in her return to the West End last year – and in Julia Savill, the company has an actress of the stature required. She reigns over the stage whenever she appears, with flamboyant costumes and a vocal range to match. 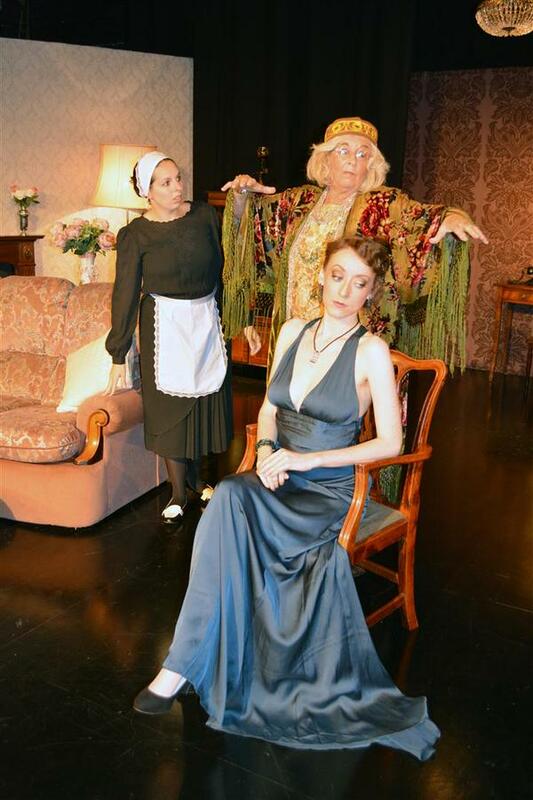 But this enduring comedy is much more than a one-woman show and director Tracy Murrey had an able and elegant cast that totally inhabited Coward’s preposterously believable love triangle and their friends and servant. Conrad Hornby as Charles Condomine was attractive and charming, with just that hint of callous indifference that will enable him to walk away from his warring ghostly wives at the end of the play without a hint of regret. Celia Muir was superb as Ruth, the second (living) Mrs Condomine. It’s hard enough being the second wife of a man who still recalls the beauty and charm of her predecessor with such relish. But to find the former wife back in the family home really is an awful lot to ask of even a very well-bred and sophisticated woman. Emma Stephens as Elvira, with ghostly pallor and a glorious evening gown, was capricious and charming, wilful, wicked and witty. Martin Bishop and Judy Norman were well-cast as the sensible older couple, Dr and Mrs Bradman, and Dani Bright brought just the right level of hysteria to the part of Edith, the maid who holds the key to the mystery. The period cut-glass Coward voices were pitch-perfect, and the pacing of the action was beautifully balanced between the indulgent languor of the monied upper middle classes at leisure and the ferocious forces of jealousy and misery unleashed by the preposterous Madame Arcati and her psychic dabblings. There is only one word for the production – Masterly. Posted in Reviews on 16 August, 2015 .